48 hours in a place as beautiful as Lisbon doesn’t seem like enough, and really, if you can afford an extra day or so there I’d recommend it. But as someone who did it in just over 48 hours a few weeks ago, if that’s all the time you’ve got to spare I’d wholeheartedly recommend stopping in and soaking up the beauty of Portugal’s capital city. Lisbon’s history is truly fascinating, the food is incredible and the nightlife is out of control. It really does have something for everyone, so let’s talk about the absolute must dos while you’re there. If you want to be in the thick of it, you need to stay in Bairro Alto. There’s so much going on here and you’ll be able to walk almost everywhere. The neighbouring area, Alfama is also absolutely stunning and perhaps a bit more romantic, but expect to climb a lot of stairs with your luggage—you’ve been warned! Airbnb’s are aplenty, but if you’re up for a couple of nights of luxury, get a room at the stunning Bairro Alto Hotel. The building itself is stunning, you can’t beat the location and the rooftop bar, BA Terrace, has some of the best views of Lisbon. Even if you don’t stay at the hotel, head here for a sunset drink and you won’t be disappointed (just remember to book ahead). If you don’t manage to get into BA Terrace for sunset drinks, never fear, stroll over to TOPO Chiado and get a cocktail or two while you watch the sunset work its magic over Lisbon. It’s near the convent but the place is notoriously hard to find so head to the Largo do Carmo square and ask someone. 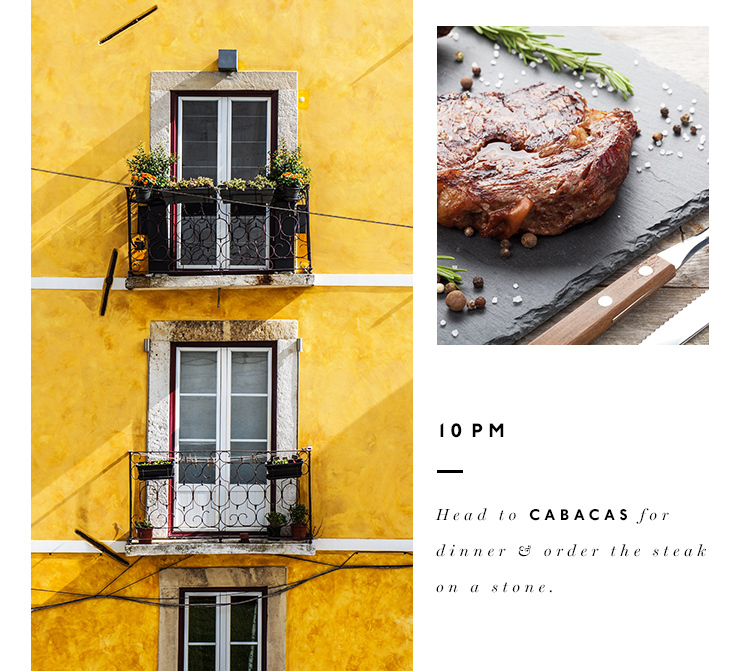 After the sun has set and you’ve finished your glass bottle of vinho verde (it’s green wine and it’s amazing) head to Cabacas for dinner. You’ll probably have to wait a little while to get a table but it’s worth it, and they’ll happily serve you drinks out on the street while you wait. There’s plenty on the menu here, but take a look around and you’ll notice everyone has the same thing in front of them—steak on a stone. Now’s not a time to try and be different, order the steak and thank me later. The raw steak comes out on a hot stone and you get to cook it exactly how you like it before smothering it in the delicious sauces they provide. It’s massive, but there wasn’t a person in sight who didn’t finish off every last bite. If you’ve got the stamina, you can keep partying. Bairro Alto is full of bars, but you’ll notice everyone is out on the street so it doesn’t really matter where you go. Find a crowd, order a drink and soak up the atmosphere, just don’t stay out too late, you’ve got a big day ahead of you tomorrow! Wake up, fill up your water bottle and put your most comfortable shoes on, we’re going on a walking tour! I know, walking tours can seem a bit naff, but this is one of the best I’ve ever done and it’s the quickest, easiest and most entertaining way to see a lot of Lisbon in a short amount of time. 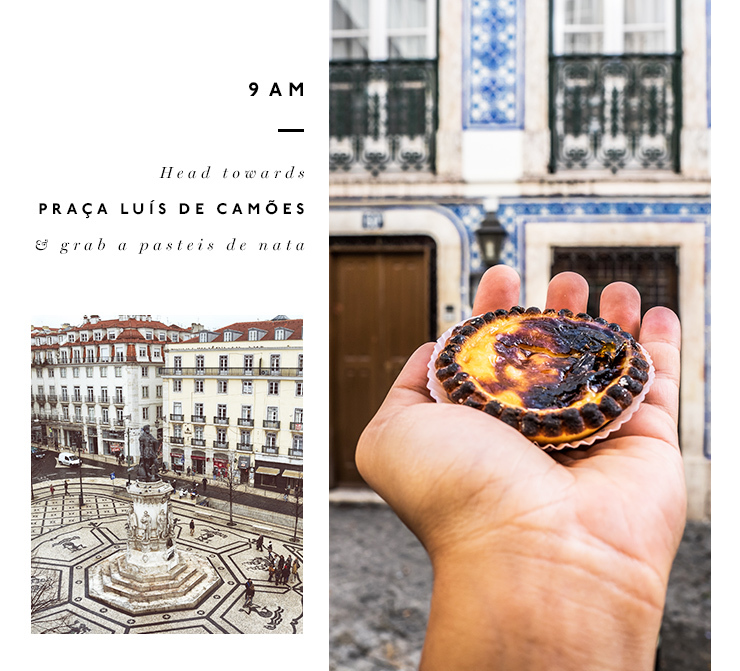 Head towards Praça Luís de Camões, the main square, and on your way stop by a patisserie for a coffee and a pasteis de nata—the famous Portuguese tart. It’s probably not going to be as good as the one you’ll be having tomorrow, but you need to eat as many of these as you can while you’re there. If you’re feeling really hungry and don’t think pastries are going to cut the mustard before a walking tour, wake up a little earlier and head to Tartine. Find the guys with the yellow cooler bags at Praça Luís de Camões, they’re from Chill Out Walking Tours and they are the absolute bee’s knees. They’re all locals and they’re passionate about Lisbon. You’ll learn all sorts of interesting things about Lisbon’s history and you’ll work up a serious appetite with all that walking. 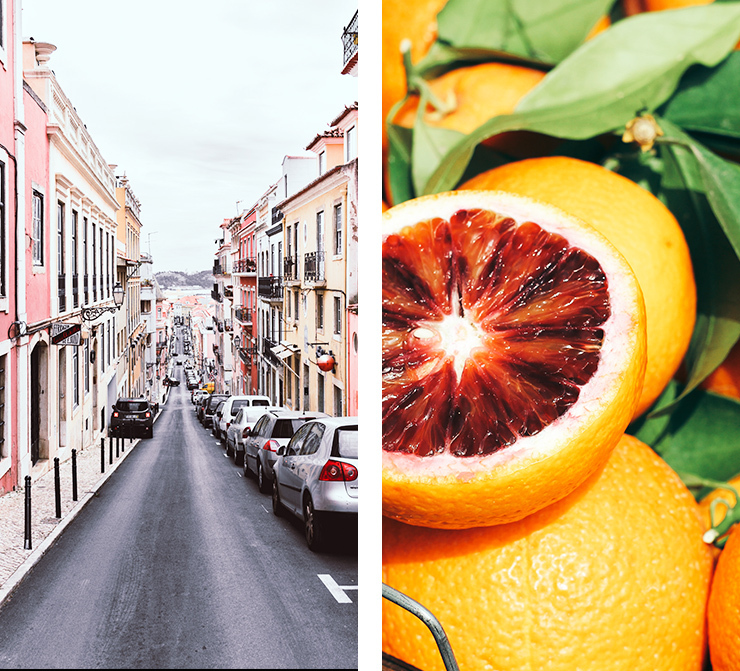 Wander down to the Time Out Markets for lunch, where you’ll find some of the best food of Lisbon all under one roof. In the centre of the markets you’ll find food stalls, shops and bars galore, so everyone can choose what they want while someone buys a jug of sangria for all of you to enjoy. If you want something a little more fancy, head to the edge of the markets and take a seat at one of the restaurants where they are dishing up fine dining eats in a more relaxed environment (and at a more affordable price to boot). Now would be the perfect time for a siesta, but if you want to keep going head to Cafe Tati for a glass of natural wine and then make your way to Miradoura Santa Catarina for some more pretty views. If you had more time (and stomach space), you could pack a little picnic to enjoy while you’re there, but you have some serious dinner plans so you’d better not. 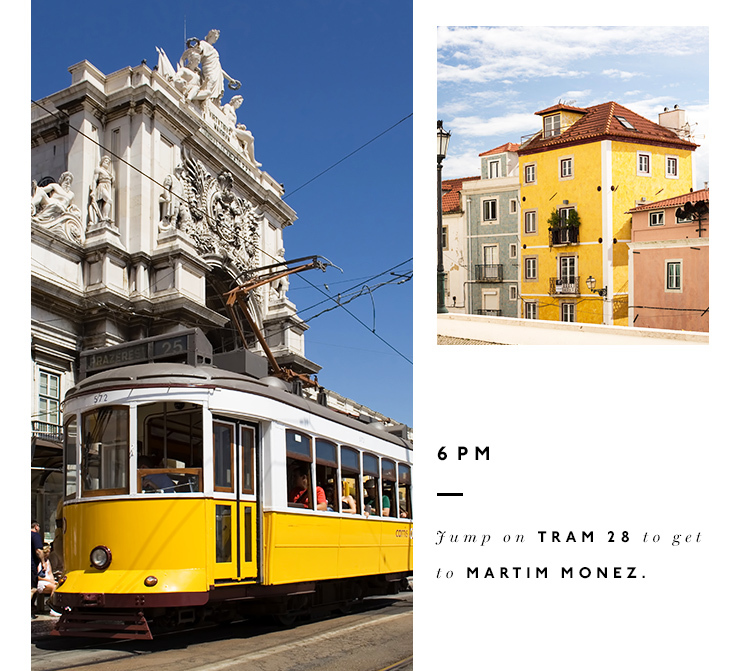 If you want to see a bit more of Lisbon, jump on the famous Tram 28 and go for a ride through the ‘burbs. If you’re in Bairro Alto, you’re basically right in the middle of the route, so if you want to do it properly you’ll need to get yourself to Martim Monez, but you can get a 24 hour ticket so you can do a few stops now and see the rest of it later if you have time. Keep in mind it gets really busy and beware of pickpockets! Tonight’s dinner is something special (so special that you should definitely book ahead!) Jose Avelliz, one of Portugal’s most famous chefs, has a few Michelin starred restaurants dotted around Portugal, but for a slightly more casual night out with all the same flavours, head to his bar, Mini Bar and opt for the Epic Menu. With over 10 courses, it’s amazing value at only 55 euro a head. The dishes are chosen by the chef on the night, but you can expect delights and surprises (the ‘Ferrero Rocher’ will get you thinking) and, if you’re lucky, one of the most amazing truffle egg dishes you’ll ever taste in your life. The Portuguese are pretty passionate about their music, and their fado in particular. Head to Clube de Fado in Alfama to get your fix. 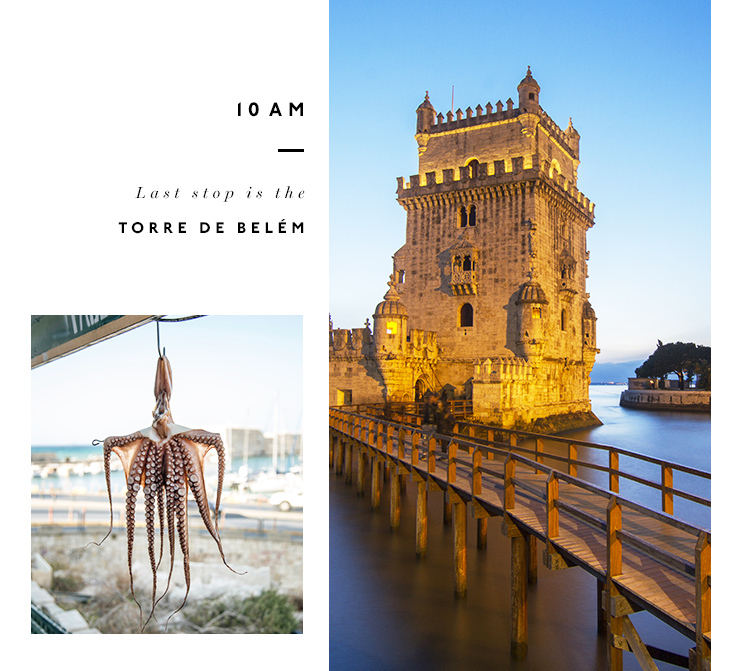 Jump on the tram or order an Uber (which are reallyyyy cheap here FYI) and head to Belém. If you’re getting an Uber get them to drop you at Mosteiro dos Jerónimos—a beautiful old cathedral with some stunning gardens—and start from there. Head to Centro Cultural de Belém for a bit of art and a coffee at the cafe overlooking the river, then go and take a look at Padrão dos Descobrimentos. The last sight you need to see is the beautiful Torre de Belém. Now that you’ve worked up a bit of an appetite, go straight to Pasteis de Belém. This is an absolute must visit and after tasting my fair share, I can confirm that they do THE best Portuguese tarts. These guys were the first to start making Portuguese tarts back in 1837 and the recipe is SUPER secret. They sell about 20,000 pasteis de Belém per day and after one bite you’ll understand why. Go past the queue who are lining up for takeaway and get a table inside and order as many as you think you can eat. Sprinkle them with cinnamon and icing sugar and enjoy the warm gooey custard, then order some more to take away. If you need something savoury after all that sweet goodness, check out Portugalia for steak and seafood or Darwin for risottos and a beaut view! If you have any more time up your sleeve, wander the streets of Principe Real where you’ll find some good little shops, bars and restaurants. Eat as many Pasteis de Belém as humanly possible. This is a MUST! Drink some vinho verde—it’s a Portuguese specialty and is a bit like a slightly sparkling white wine. Eat the famous Bacalhau a Bras dish. It’s salted cod served with shredded potato, onions and egg. It’s not something I’d ever order usually but I was convinced by a local and loved every bite. Eat some sardines, even if you don’t like sardines. If you’ve got an extra day head to Sintra. It’s about 45 minutes away and it looks absolutely breathtaking. Want more? Here's how to spend 48 hours in Marrakech.